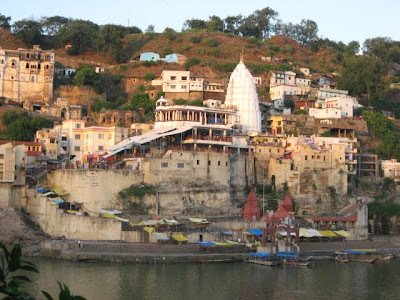 My trip to Omkareshwar, the home of one of the 12 Jyotirlings, was one I was looking forward to, since the temple lies on a small, hilly island on the Narmada, one of the seven holy rivers of India. I made our plans well in advance, checking out all details, and making arrangements for our stay. While I was amazed at the lack of information about the temple and the location, I was pleasantly surprised by the website of the MP Tourism department, which was easy to navigate and allowed me to book rooms at their resort without any trouble. 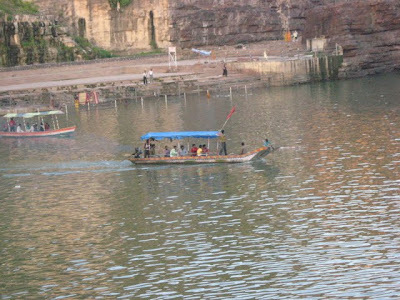 MPTDC’s Narmada resort is the only good option for accommodation at Omkareshwar. Bookings have to be made online or at their offices. Phone booking is not possible. All others are just age-old Dharamshalas run by various ashrams from all over India. The only other silver lining is the Gajanan Maharaj Sansthan of Shegaon in Maharashtra, who have observed the lacuna and tried to fill it, building a modern Dharamshala, with AC and non AC rooms with all comforts. While we were unaware of this, and couldn’t try them out, you can contact them at 91-7265-252018 or send them a mail at gms@gajananmaharajsansthan.org. We stayed at Gajanan Maharaj Ashram. It was very nice, clean and had big rooms very cheaply priced ( eg.2bed Rs.225, 3bed Rs.280, 4bed Rs.350 etc.). Though we were two only, they gave us 4bed with cooler at Rs.350 with English toilet. They have a canteen where breakfast, lunch and dinner are served at Rs.25 in Marathi cuisine. They would keep on giving you the food items in lunch and dinner till you say no more. 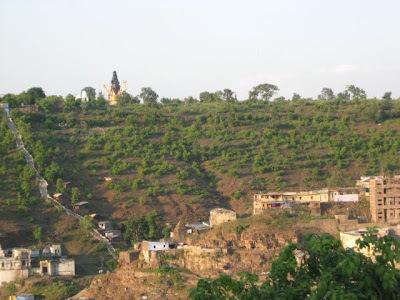 The locations of Mamaleshwar and Omkareshwar temples were within 10 min. walking distance from the ashram. 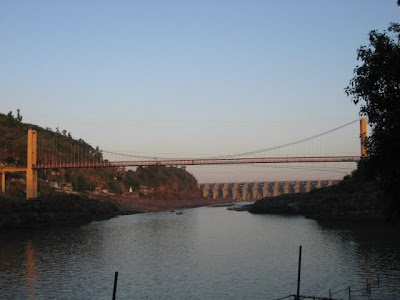 The road to Omkareshwar temple goes through the bridge so one need not cross the river by boat and the road goes directly to the temple. Omkareshwar is about 65 Kms from Indore, and the road is in quite a good condition, except for the last portion, where work is in progress. 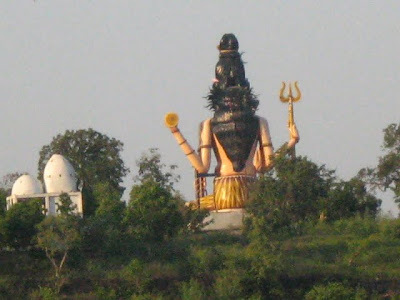 The journey from Indore to Omkareshwar takes about an hour by car and an hour and a half by bus. 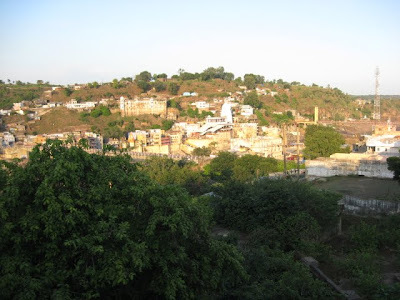 There are plenty of buses from Indore to Omkareshwar – one every 5 minutes or so. We were surprised to see that the buses, though not great, were quite comfortable. The Omkareshwar Road railway station puts the town on the railway map, but since it isn’t a very important line, there are only a few passenger trains passing through, and the only major city it connects to, is Indore. The journey to Indore is better made by bus than by train! 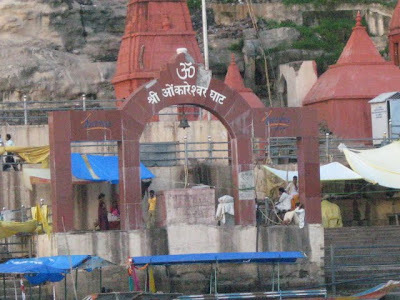 There are two important temples in Omkareshwar – the Omkareshwar temple on the island, also called Omkar Mandhata, and the Mamleshwar temple (also called Amaleshwar or Amareshwar) on the mainland. There are plenty of legends and myths about the island and its temples which obscure their reality. 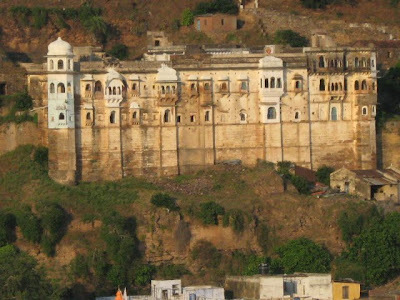 The temple on the island is believed to have been consecrated by Mandhata, an ancestor of Rama, who performed penances and became a great sage. 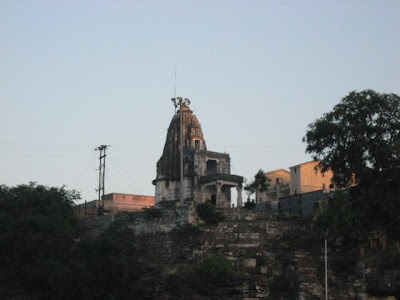 However, it is not too clear about which temple houses the actual Jyotirling. 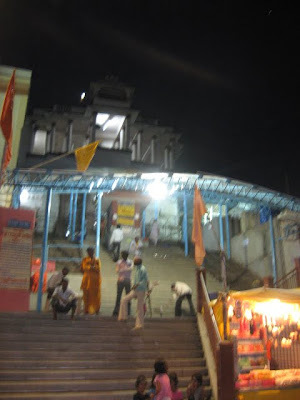 While some stories insist that the lingam that Mandhata installed split into two, there are other sources which indicate that the Mamleshwar temple is older and thus the real Jyotirling. In any case, history leans towards the second, since a sloka referring to the 12 temples clearly mentions “Omkaram Amaleshwaram”, thus indicating the second temple. Contrast this to the situation at the other temple, where we were badgered by the pandas right from the mainland, and one stuck to us like a leech till my father-in-law gave in, knowing that we couldn’t do the puja without one of them. After all the pestering, the man refused to use most of the things we had brought saying that they were not used for this lingam, and interspersed his rendition of the prayers with mention of Dakshina (offering to the priest) and demanded more and more till we finally walked away in disgust! The most interesting thing about the island temple is the presence of a cave under the main temple, cut into the cliff face. This cave is believed to have been where Sri Govinda Bhagavatpada, the guru of Adi Shankara lived, and where Shankara as a young boy came when the Narmada flowed fast and furious, seeking the preceptor who would lead him to the right path. It was here that Shankara was initiated, and even in this day of rampant commercialization, this small cave has been left untouched by materialism! The inner parts of the cave have now been closed, but just a step inside the cave makes one feel as if we have stepped into a different world! Let me take you on a pictorial journey through Omkareshwar while I write up more details about the best portion of my trip – the Omkareshwar Parikrama. Our first glimpse of the island from our room at the Narmada Resort. 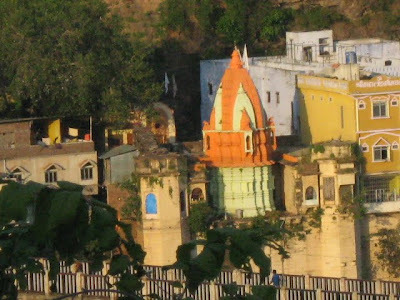 The Omkareshwar temple on the island. The Omkareshwar ghat, where the boatman drops us, and where we begin our ascent to the temple.. I also find staying at Govt. Guest houses more economical and better than private hotels whenever I go to a remote place. you really take us there! Now I am really bookmarking this post, thats just like lonely planet travel guide writtern with ease and simplicity for readers. I can see how much hardwork has gone into collecting, assimilating, writing this. Kudos!! 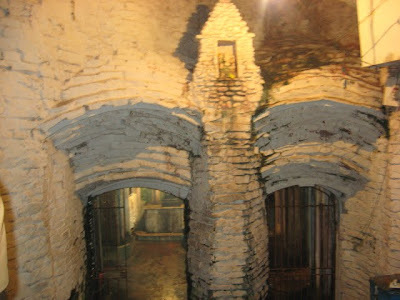 The cave of Sri Govinda Bhagavatpada is very interesting formation. Loved all the pictures, Please keep us engaged with such lovely stories. There you go ! You have taken us to the place with your photos and your post is full of information. @ Tarun : In remote places, I agree, Govt guest houses are better than most others... but not always... there are places, especially at small temple towns where it is better to contact someone and stay at his house rather than the guest house!!! @ Sri : THanks again... well, i had to do all that for my trip anyway.. and its been a pleasure sharing all the info with all of you..
@ Nisha : Thanks..... Glad you all liked it.. The place looks very beautiful and serene through your pictures. @ Bindhu : absolutely none!!! which is why i have decided not to go there for the temple anymore.... and as to why i still want to go there sometime, read Part 2 !!! There Is One More Interesting Thing About This Place Is When You remove Flowers From The Top Of Ling a Showers Of Water Came Out & It Is Said That These Are The Sprinkles Of Devi Narmada. you're really a great writer,the moment i started reading your post it felt like i'm there. by the way i have been there recently and i only go to omkareshvar and mamleshvar temple, unfortunately i didn't read that post before and i missed the Cave. you are right about priests there. they keep asking for money till you give them. first they will ask you to give money for priests food, then there accomodation then for gau mata and so on.